Judging by the fact that at the time of writing, I am laying on a beach surrounded by an army of half-naked lobsters (aka sun-hungry Brits, me included), I am confident in stating that our well anticipated summer is well and truly here. And judging by the fact that at the time of editing, I am now hiding out in my bedroom to escape the wrath of a devilish hailstorm, I am confident in stating that this post is now fairly ironic. I'm not trying to depress you all, I promise. Choose your company wisely. Remember, this is practically an entire day we’re talking about, an entire day of your life that cannot be replaced. For the love of sweet Sherlock, don’t invite that friend that drives you half bonkers after 40 minutes, or the Aunt that speaks of nothing else but her crusty scalp condition. Conversational anti-climax, anyone?! Get travel savvy. If you have a specific destination in mind, you need to know that you can actually get there, when you want to get there. I know it’s pretty simple stuff, but all too often I encounter puzzled looking people on platforms, caught in the midst of a Class A whinge about something journey time/route related. The hassle is oh-so-uneccessary. Get yourself on Google Maps, or on National Rail, and make sure you know your journey back to front and sideways before you even leave the house! Wear an appropriate outfit. Staggering around for 6 hours in 7-inch heels is like trying to win a race with feet made out of hedgehogs. Pretty. Bloody. Hard. Chilling out in the sun in a woolly jumper causes extreme human odour issues. Exposing excessive tatty-bo-hood whilst touring a manor house will earn you nothing but seventeen raised eyebrows and a couple of tuts. Don’t get me wrong ladies, I love the tatty-bo-hood, but there is a time and a place! Stock up on goodies. I always take a little waltz to Tesco prior to my adventure, mainly because I seem to have inherited Granny B's sublime day out organisational skills, but also because I like crumbly biscuits. And headache tablets. And sandwiches. And guess what? If you’re after slightly more important stuff like car insurance, they can sort that out for you too. Who the devil knew that a 24 hour store could be so damn useful?! Buy an ice cream. No summer's day out is complete without a tasty cone of creamy goodness. 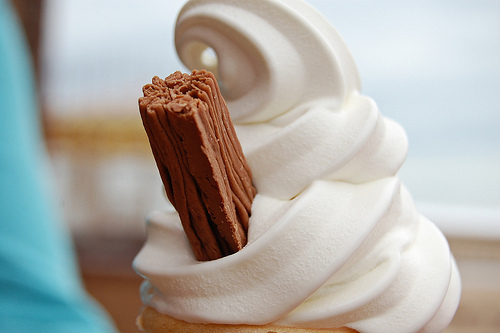 Oh Mr Whippy, you darling, you. Gobble, gobble. Be creative. If you’re a creative type, which I’m assuming you are, (you’re happy to read my endless, quirky waffle after all…. ), then use your day out as an opportunity to soak up new inspiration and produce something wonderful. Yes, I’m talking to you, you closet genius. Take lots of photos. When I say take lots of photos, I mean take a photo of absolutely everything, including the half-squashed ice cream. I have a terrible habit of taking photos of my feet wherever I go. In my mind, I seem to think this says ‘oo, check me out; I’m in this funky place, just chilling, living life’, when actually it just implies that I am the most unoriginal photographer that ever strolled the earth. If anyone can tell me why I do this, I will send you a signed photograph of said tootsies. This little piggy went to the market. Phwoar. Have a chinwag with somebody new. Human folk are a divine species. They're brilliant, I love them, and I want to meet more of them. I hope you love them too. Mourn the loss of the most delicious snack of the day. And by that I mean the ice cream, not the torso. Honest. I wish you all a glorious summer (well, what we have left of it anyway...), and I trust you will all be doing lots of fine and funky things with it. I'm hungry for new places to throw ice creams around in. Do you have any recommendations for me? Where do you head to when you're in the mood for a jolly good day out?! *Thank you to the kind bunch of humanfolk who sponsored this post. Haha! Brilliant! I SO want that ice cream now! This whole post makes me think of Brighton! I really wanna go there for a jolly good day out soon. Come to London and I'll take you to Hampstead Heath. It's beautiful. There's even a lake and maybe a few leftover protestors from last month. Haha! I know, the ice cream looks DElicious doesn't it. I kind of want to lick my laptop screen, but I won't, because that's pretty strange. Brighton is super funky. You should come down and I can meet you there and we can be all jolly! Ah, I've never been to Hampstead Heath! I shall hold you to that one fine lady! ;) I'm happy to pick up a few leftover protestors too...! Excellent tips and of course you have made me giggle several times during this post - I am now craving a Mr Whippy ice cream as that photo looks scrummy!